Product descriptions will make or break whether or not a customer wants to buy from you. It’s very common for businesses to write boring and generic descriptions without realizing their importance. This results in missing out on sales. But, if you take to the time write good product descriptions, you can look forward to a better conversion rate. By mastering the art of features versus benefits. If you can grasp this copywriting strategy, you are guaranteed to see better performance from product pages. Follow along as I explain what this technique is, how to use it, and real examples. Product features are factual pieces of information about what you sell. Think sizing, color, fabric, or dimensions. These are the details that make up a product, and sure, they have to be stated. However, you will notice that most businesses only mention the features. Harvard professor Gerald Zaltman wrote a book called How Customer Think: Essential Insights into the Mind of the Market, which covers his belief that 95% of purchasing is emotional. There are many emotional, primal, and frankly irrational beliefs that going into buying products some times. Consumers are smarter than they have ever been with infinite amounts of resources, reviews, and information at their fingertips. But Zaltman has studied consumers unconscious behaviors while shopping, and noticed that there are many contradictions about what they say versus do. Gerald believes this is because many unconscious urges and feelings drive us to make purchasing decision, and decisions in general. Product benefits are the emotions and experiences that a customer will gain from using your product. This is what customer are truly after. Do you think they care about the polyester fabric and v-neck shape of a t-shirt? However, customers would more than love to hear about how that t-shirt will match with any outfit, boost their confidence, and not lose any color after being washed. What I just listed are the benefits. Let’s look at some real life examples of features vs benefits in action. Bologna construction means flexible, breathable comfort in a charming monk shoe built from hearty Italian suede. Instead of only mentioning the construction method used to make the shoe, Magnanni made sure that customers understand it results in flexible, breathable, and comfortable footwear. Fashion is an industry that is especially important to write good descriptions because it’s difficult to display a value proposition. I use to run a men’s shoe e-commerce company, and I’d recommend anyone in that space or similar to focus on comfort, confidence, and similar attributes when writing copy. Consumer Acquisition is a business that helps mobile app companies improve the results of their Facebook and Google UAC campaigns. We have assembled an elite in-house creative team with vast experience in storytelling, animation, visual effects, and user acquisition. They provide an endless supply of new videos and images that consistently produce winners. The first sentence describes the features of their creative studio tool, which includes a team of in-house creatives that have experience with animation and user acquisition. But, what’s going to be the first thought that runs through someone’s head reading that? Hence why the second sentence elaborates on the benefits, including an endless supply of creatives that produce winning campaigns. We quickly identify and resolve creative fatigue. Our creative testing framework and hyper-segmentation of audiences maximize ROAS. Also, we have proven UA strategies for apps that monetize with IAP or ads. The feature is creative testing and segmentation with the benefit of maximizing return on assets and better monetization strategies. The above image is the description for a women’s Fossil watch. Style is all about expressing your feelings and looking unique, so Fossil aligned their product description with this benefit of their watch. You should know what Hootsuite is unless you’ve been living under a rock. In the case you’re like Patrick from Spongbob Squarepants, Hootsuite is a social media marketing tool that makes the lives of entrepreneurs much easier. I want to use the scheduling feature of their website as an example, beginning with the following. 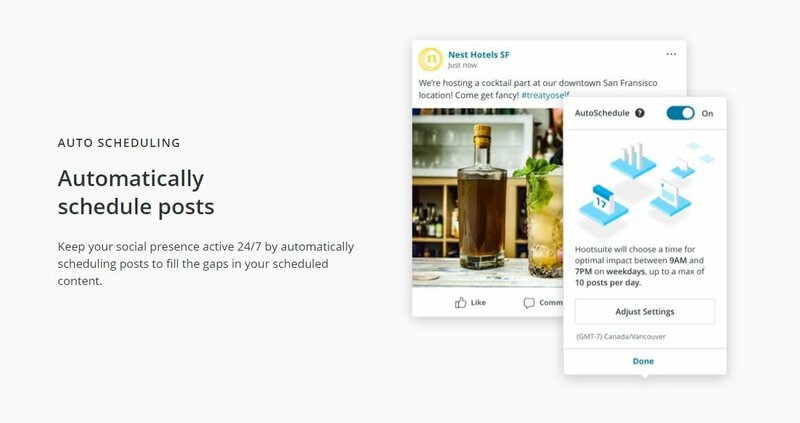 Scrolling down the page, Hootsuite directly mentions why their bulk scheduling is beneficial by explaining to users it will save them time. Every time you’re writing a product or service description, ask yourself “What does this actually do for the customer?” and you will always find the benefit to elaborate upon. Hootsuite also offers a mobile app. While they could’ve ended it there, they made sure to speak about the convenience of using it anytime, anywhere. 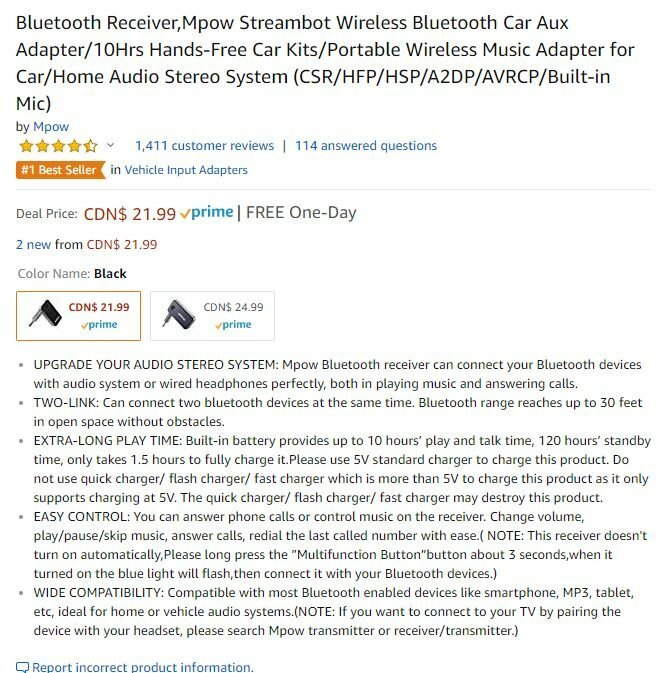 This is a screenshot from the product page of a Bluetooth receiver on Amazon. There’s tons to learn from their copy that I wanted to share with you. UPGRADE YOUR AUDIO STEREO SYSTEM: Mpow Bluetooth receiver can connect your Bluetooth devices with audio system or wired headphones perfectly, both in playing music and answering calls. The first bullet point tells customers that they will be able to enjoy music and answer calls, effectively upgrading their cars audio system. Older models don’t come equipped with Bluetooth built into them, which is a great benefit of this item. A concern a customer may have with this product is the range. Mpow resolves this by saying the receiver can reach 30 feet, and connects up to two devices at the same time. I don’t know about you, but I know that when I’m purchasing electronics I’m always curious about battery life. This is why Mpow ensured to cover battery life, standby time, and how long it takes to charge. Last but not least, the product description explains the feature of easy controls. What are the benefits of this? Answering phone calls, controlling music, changing volume, and more effortlessly. Understanding features vs benefits in copywriting is crucial for all marketers. It is a fundamental component of producing product or service descriptions that convert. Here’s a wrap-up of the main takeaways from today. Features are the factual pieces of information about a product. Sizing, color, and material are examples of such. Benefits are the emotions and experiences a customer gains from using a product. The purchasing process is very emotionally driven, hence why benefits need to be stated. They interest customers, grab their attention, and speak to their needs. Previous articleCall to Action: The Ultimate Guide For MarketersNext article Ubersuggest Review - Is It Worth it?